The other week I was in Indiana just at the start of their strawberry season. 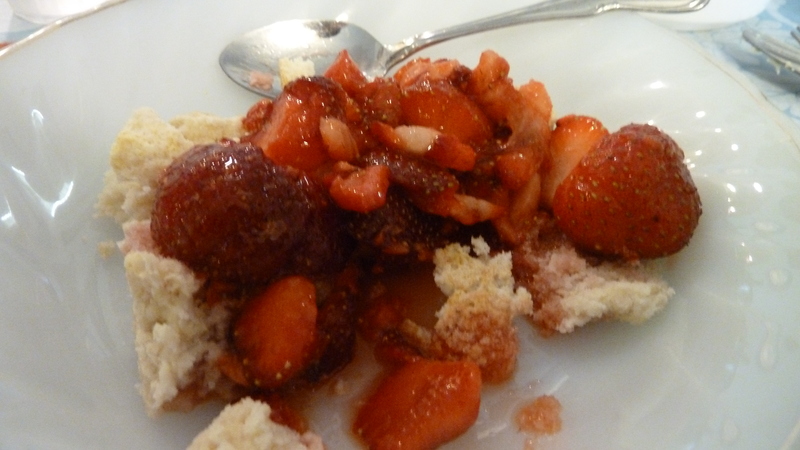 I hankered to enjoy an evening meal of shortcake and strawberries. When I learned there was a U-Pick patch a stone’s throw from Mom’s retirement complex, I went over early the next morning. Only $1.25 a pound. What a delight to dig into a bounty of delicious berries in long straight rows after picking on my somewhat difficult hillside patch, described here. You’re thinking they eat shortcake as a meal? How healthy is that? Well, the kind of shortcake we like for a meal is not a sweet cake, more like a biscuit, made from a mix and doctored up just a tad. Cheating, I know. We use either Bisquik ® or Jiffy ® Mix. A cup or so of chopped, lightly sugared fresh berries. A half cup of milk. Four food groups. A cup of strawberries supplies 160 percent of your daily Vitamin C, plus some fiber and potassium. Protein and calcium in your milk and cheese or deli meat. A small amount of veggie/fiber in your lettuce, or perhaps a carrot on the side if you insist on a traditional veggie. Where the healthy comes in too, lest we forget, is that this is pretty much a low-effort, stressless meal. That has to count for something. You clean the berries, you bake up the shortcake, the house fills with delicious scents, you serve, you eat. Pure enjoyment. I’m mostly about eating simply which counts for a lot in the summer. Then the surprise. On my recent visit, Mom shocked me by saying she NEVER LIKED the soggy bread part of these meals. And now that Daddy is gone, she feels free to skip the milk-soaked bread, and just have milk and strawberries, milk and peaches, and her bread on the side, not all mushy like Daddy loved. Now I’m wondering what if Daddy ate it that way because he thought Mom liked it that way? Kind of rocks the underpinnings of your understandings about your parents, you know, if they could live with such secrets. But that’s always the way I liked Mom’s shortcake best too—I crumbled a little for my strawberries and milk, but saved a nice hunk to eat on the side, warm and slathered in butter. I was never able to get my husband and three daughters to enjoy this as an evening meal except for when we were at Grandma and Grandpa’s house. They ate it then. If I served at home, someone was sure to ask, “Is this all we’re having for supper?” (But then, we do not have our main meal of the day at noon!) So it remains a special treat just for strawberry season, just at Grandma’s house. Some foods are like that. But maybe your family will think it’s cool. And the results from the “How do you like to eat your strawberries” poll a couple of posts ago? Neither jam or cheesecake got a single vote. Stir mix, milk, sugar and melted butter until it hangs together. Spread into greased 9 inch pie pan or other baking dish of those approximate dimensions. Bake in 425 degree oven for 10-12 minutes or until golden brown. Slice into pie-sized servings of your choice, for 6-8. Serve while warm. Did you ever learn something new about your parents, or your mom or dad that surprised you or changed your picture of them? Or, did your mom or dad ever stop doing something once their partner was deceased? I’d love to hear more. For hundreds of recipes helping you cook whatever is in season, check out Simply in Season, from Herald Press. Your simple, sweet supper, post reminds me of the sorrel and raisin milk soup my mom cooked and served for supper with fried potatoes in early spring. When other fruits were available, like pears or apples, they’d take the place of the sorrel raisin mix. And then there were the watermelon and rollkuchen suppers later in the summer, or just a pot of freshly picked corn on the cob in August. We didn’t always worry about complete and balanced meals, but lived and ate local foods with relish. I suspect we were just as healthy. I just can’t imagine eating it soggy like that. I like the angel food as it sops up all the berry juice but retains it’s substance. I make Bisquit mix in bulk and store in fridge rather than buy the store bought. Your story makes me think of a passage in a book I read yesterday. He says to his new wife after she serves him his third cup of coffee, I guess I better tell you this now, since we’re going to be married a long time, but I don’t really like coffee. She says, neither do I! But she thought he liked it because he always took it when offered! Thank you Athanasia, that’s exactly the kind of story I was thinking of! It happens! My parents an example. I’d love to see your recipe for Bisquit mix in bulk, do you put any shortening in it? That’s a better “more with less” idea and I’m sure there’s a recipe in that cookbook for that. Melodie, That brings back such great memories of my childhood. I still like cold milk and bread (with fresh fruit). soup. It was also often a summer evening meal at our house,and with “raw” milk to boot. 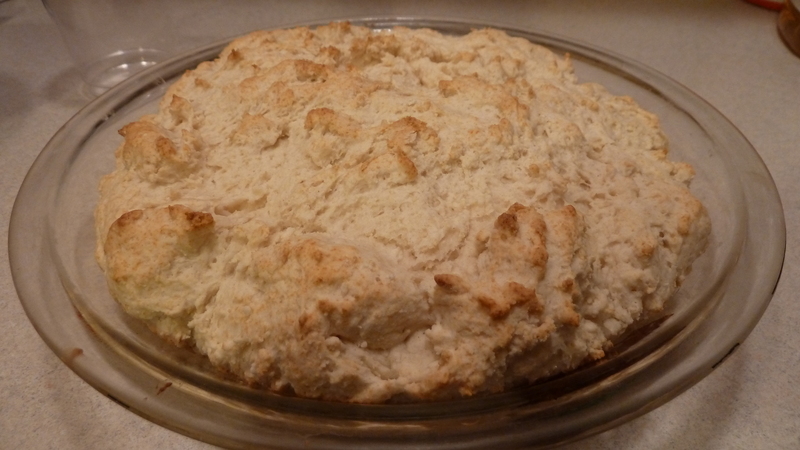 The biscuit like short bread is also still my favorite for shortcake. Strange but I can not abide bread soaked in Hot MILK like in bean soup but I like it in cold milk. I guess I am a little weird. Alice, glad to know you’re fans of the biscuit like shortbread — that’s a much better name for it. We each have our tastes and favorites–I did like the bread in bean soup with milk, although I do not make it that way anymore. Thanks for the comment! 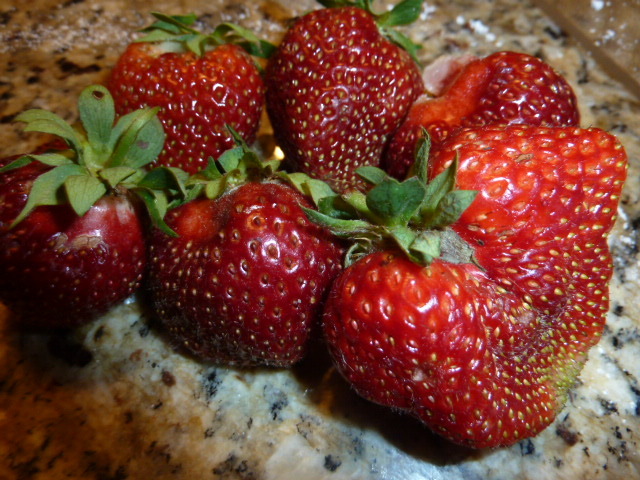 Good memories – picking strawberries in our patch on the farm east of Goshen – having strawberry shortcake or bread and milk for many suppers. I still enjoy the cold, soggy bread and milk soup. Margaret, glad to hear from you and that you enjoyed the memories this evoked. Thanks for chiming in. Melodie, In response to your question, we still produce “JIFFY” Baking Mix. If you are having difficulty finding certain “JIFFY” Mix products, at a store near you, try our online product locator at: http://www.jiffymix.com/locator.php Although they are not included in our product locator, Walmart Supercenters carry a variety of our mixes, including “JIFFY” Baking Mix. If you have any questions you may call one of our helpful consumer relations representatives at 1-800-727-2460, Mon. – Fri. between the hours of 8:00AM – 4:30PM ET. Very cool! Glad you found this and I’m glad to know it is still available at many Walmarts. Bless you! Your post stirred up memories of my childhood 🙂 We often made a meal of strawberries and shortcake (biscuit type) in the summer. We also had something we called blueberry soup, which was torn up white bread with milk and blueberries. I’m sure this was a way of stretching a box of blueberries for a family of nine. It’s interesting to me that so many other families ate the same way back in the 50’s. Another meal was hot cornbread with milk. Glad to know the strawberry story stirred up memories for you. We didn’t call it blueberry soup but we ate it too! But we never had hot cornbread and milk. Thanks for your stories too!